The foramen (latin for “window”) is the hole through which	a spinal nerve exits the spinal column to travel down the arm. Foraminal	stenosis is narrowing of the hole causing compression of the spinal nerve. Foraminal stenosis can be due to a disc herniation/degeneration or degeneration	of the facet joint. A cervical foraminotomy entails a minimally invasive	microscopic procedure that enlarges the foramen by removing a small amount	of bone, ligament, and joint capsule. In the right patient, the foraminotomy	is a good alternative to a fusion operation. Figure 1. 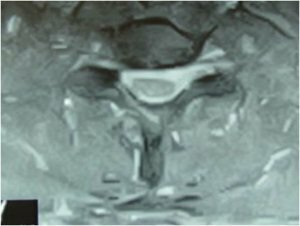 This is an MRI axial image that shows the narrowing of the foramen	(black triangle) on the left of the picture causing compression of the	exiting nerve root (white structure). This patient is an ideal example	of a candidate for a minimally invasive microscopic foraminotomy.